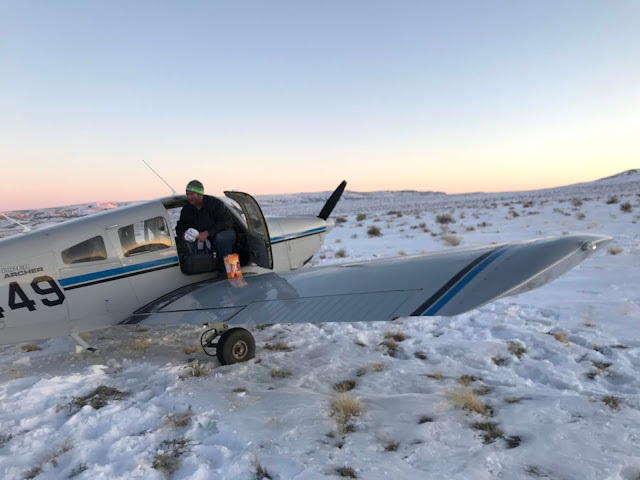 ROCK SPRINGS, Wyoming — A family flying a small plane from Nebraska back to Heber City on Monday evening found themselves in trouble when they ran out of fuel and had to make an emergency landing in a freezing, remote area of Wyoming. 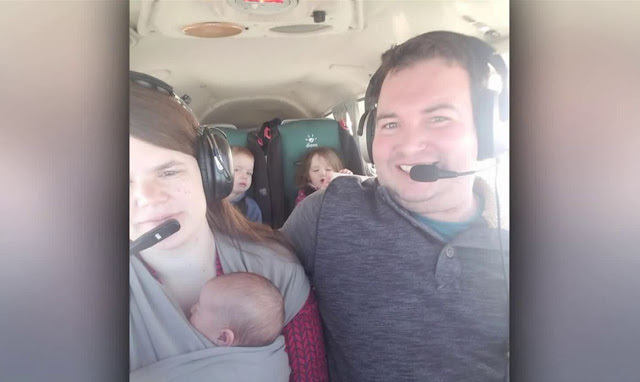 The pilot, Eric Holt, his wife and their children — 2-year-old twins and a newborn baby — were flying in a Piper Archer single-prop engine fixed-wing airplane when they encountered an "unexpected strong headwind" on the way to refuel in Rock Springs, Wyoming. "I thought we had enough fuel. Literally three minutes from the airport, the engine started going out," Holt said. "My wife asked me over the head set, she asked, 'Are we going to make it to the airport?' And I said, 'No,'" he recalled Tuesday, speaking as he returned to the site of the accident. About 5:30 p.m., while at an altitude of approximately 8,500 feet, the plane's engine sputtered and died, according to a news release from the Sweetwater County Sheriff's Office in Wyoming. "There was just the training that kicked in," Holt said, and he successfully made an emergency landing. The Holt family touched down in a remote desert area with "no apparent means to escape." The temperatures were frigid and the wind chill was estimated at below zero, the news release states. The pilot was able to contact aviation authorities, who reported the situation to emergency dispatchers. Deputies learned from GPS coordinates that the plane had landed about 3 miles southeast of Southwest Wyoming Regional Airport, officials said. The rescue effort began. Because it would take search and rescue crews several hours to reach the remote location, an Intermountain Life Flight helicopter was diverted to pick up the family and take them to a hospital for evaluation at about 8:45 p.m., according to the release. "From that point, we knew we were going to be OK," Holt said. Cody Nish, Intermountain Life Flight pilot, was already in the area on an unrelated call to transport a patient in a Rock Springs hospital when he learned of the stranded family. Another helicopter from Ogden had been dispatched to help, but that crew was 50 minutes away. "So we said, 'Well, we're right here. We've got our night vision goggles and we can take the flight, as long as the hospital's OK with it,'" Nish recalled. Holt had turned on the position lights on his downed plane, so when the Life Flight crew left the hospital, night goggles enabled them to see the beacon "clear as day, so we were able to fly right to the airplane," Nish said. He said when he got to the plane, "I could see (the pilot's) tracks right in the snow. And I mean, good on him. He did an amazing job. That airplane landed right in the snow just as it should … he did a really, really good job putting that thing on the ground." The family was "super cold," Nish said, but uninjured. "So for them to stay there and use their body heat in that small space was the best thing to do." He said he believes the family watched a movie on an iPad while rescuers tried to reach them. Holt said, "It's been an absolutely amazing 24 hours. We're just so thankful to be alive and for the kindness everyone has shown us." Sweetwater County Sheriff John Grossnickle thanked his deputies and other staff members for their "dedication, diligence and selflessness" and said that the actions of all involved in the rescue brought "this potentially tragic event to a positive conclusion." ROCK SPRINGS, Wyoming -- A Heber Family is safe at home after a wild 24 hours. Monday night they had to make an emergency landing in the middle of the Wyoming Desert and wait hours for rescue crews in the freezing cold. “We were extremely blessed to be able to make it out like that,” said Eric Holt, who was flying the plane. The family of five, complete with 2-year-old twins and a 2-week-old baby were making their way from Nebraska, home to Heber. When they hit an unexpected headwind, Eric decided to stop for fuel in Rock Springs, but the tank was already too low. “It started sputtering so I switched fuel tanks that one kicked back on for 10-15 seconds and that one started sputtering as well,” Holt said. Eric's heart dropped and so was his plane. “The first few seconds were just, 'oh crap, this plane is no longer working,'” Holt said. His young family was worried about their fate. “My wife asked me over the headset and she said, 'are we going to make it to the airport?' And I told her no,” Holt said. So the family did the only thing they could and braced for a bumpy landing. “I picked a spot, I went for it and I landed as best as I could, and I’m amazed how well the plane is intact. There doesn't seem to be any damage I can see right now,” Holt said. Holt says that's thanks to the several feet of snow, but because temperatures were 10 degrees below zero, it was waiting for rescue crews, in the remote area, that was the scary part. “We decided it's warm in the airplane for the moment, we're going to keep the door closed. We're going to stay put and keep as warm as possible,” Holt said. For more than three hours, the family waited not knowing how crews would get to them. Finally, from inside the plane, they heard a medical helicopter landing. “The pilot took the coat off his back and hat and put it on my wife. Nothing gratitude for everyone,” Holt said. “It's been an absolutely amazing 24 hours and we're so grateful to be alive and for the kindness everyone has shown us." That plane is still out there, and Eric’s not sure how long it will be there, or how they will get it out, but at this point, all that matters is they are safe. A family of five — including 2-year-old twins and a newborn infant — were rescued unhurt Monday after the airplane they were traveling in ran out of fuel and landed a few miles from the Rock Springs airport. 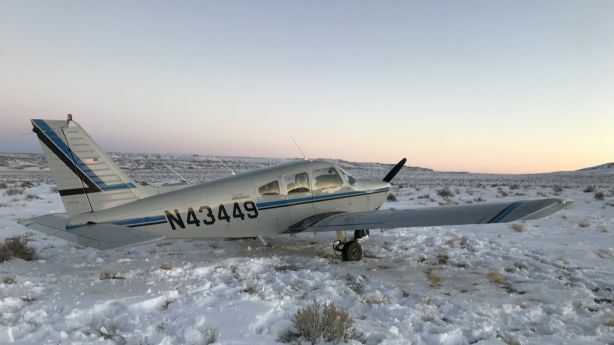 The plane — a single-engine Piper Archer — was piloted by a man flying from Wayne, Nebraska, to his home in Utah with his wife, twins and 2-week-old infant child, according to the Sweetwater County Sheriff’s Office. While flying into Rawlins, the plane encountered “an unexpected strong headwind,” and the pilot realized he would run out of fuel before reaching the Rock Springs airport. At 5:30 Monday night, the plane’s engine began to sputter and died while flying at around 8,500 feet, according to the sheriff’s office. The pilot was able to land the craft in a “snow-covered field,” leaving all of the occupants unharmed and the craft undamaged. Still, “winter conditions and frigid temperatures, with an estimated wind chill well below zero, left the family cold and stranded with the aircraft in a remote desert area with no apparent means to escape,” according to the sheriff’s office press release. Sweetwater County sheriff’s deputies located the downed plane using GPS coordinates but determined it would take hours to reach the family using tracked vehicles, according to the release. Instead, first responders were able to call in a nearby life flight helicopter. At 8:45 p.m., the family was picked up and taken to the Memorial Hospital of Sweetwater County.